Earthzine March 2, 2015 Earth Observation, Water, Would You Believe? Slushy waves on a Nantucket beach, February 20, 2015. Photos by Jonathan Nimerfroh. As you well know if you live there, the eastern United States has been in a deep freeze throughout February, 2015. Wave after wave of ice and snowstorms have hit the region, and NASA says that hundreds (maybe thousands) of records have been set for daily low temperatures. 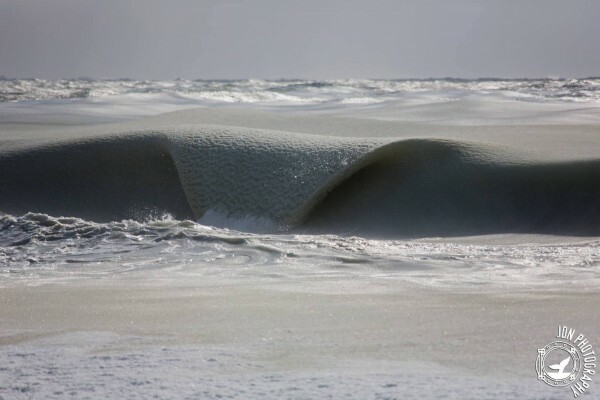 Now, from a photographer and surfer in Nantucket, Jonathan Nimerfroh, we have this amazing photo from February 20, 2015 of an ocean wave, just before it freezes solid. He calls it a slurpee wave. I just noticed a really bizarre horizon. The snow was up to my knees, getting to the water. I saw these crazy half-frozen waves. Usually on a summer day you can hear the waves crashing, but it was absolutely silent. It was like I had earplugs in my ears.